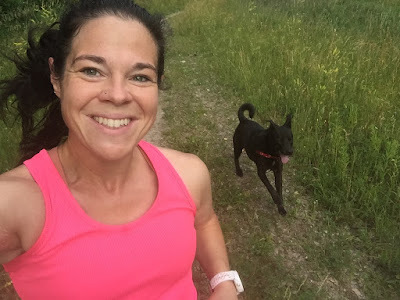 Yesterday morning, I hadn't been planning to go for a run, but I was feeling kind of energetic, so I just decided on a whim to go run a few miles. I wanted to knock one of the Cookies Summer Running items off the checklist, so I skimmed it quickly and was planning to do the "Generous Run"--where you leave a few quarters in random spots on the run for other people to find. Then I remembered the stupid birds from Monday, and I really didn't want to go. I know it sounds ridiculous to be scared of birds, but they are terrifying when they're squawking and dive-bombing your head. They don't just do it once, either; they will follow me up to a quarter mile down the road sometimes. Running faster doesn't do anything, because they're faster than I am of course, but my heart RACES and it feels impossible to catch my breath. Then, for the rest of the run, I'm extra paranoid every time I see a bird. 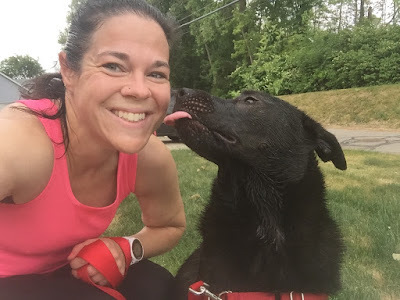 Instead of giving up on the run altogether, I decided to do the "Rover Run"--taking Joey with me. I hoped that the birds would be less likely to attack if they saw a dog. Also, we had plans to pick up Olivia (the kitty we are fostering) later in the morning, so I thought it would be a good idea to get Joey worn out so he wouldn't be quite so excited when we brought the cat home. Joey saw me getting on my running shoes, and gave me his sad look, because he knew I was leaving. I said, "Do you want to come with me?" and he definitely knows what that means. He got crazy excited, and even grabbed his collar off the table in the living room. 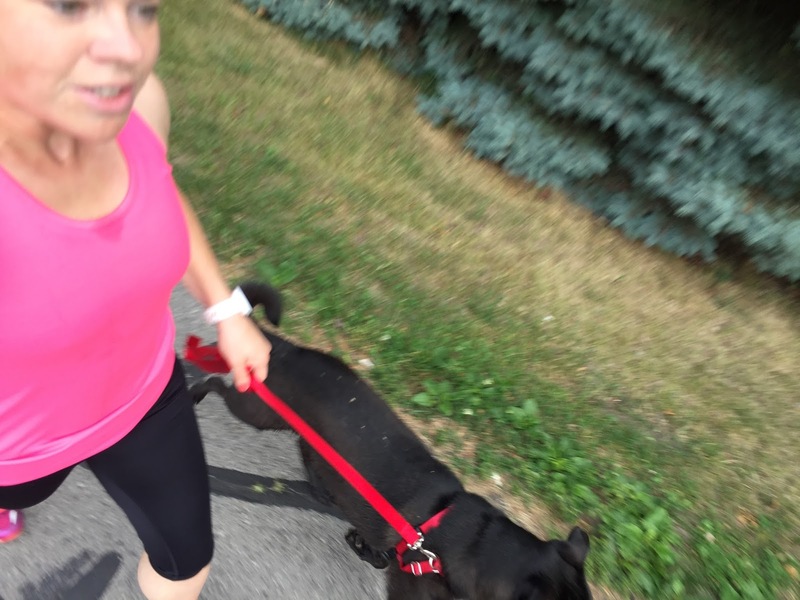 It was SUPER nice outside--not at all humid like it was on Monday--and I was excited to take Joey on a run. No idea what I was saying here--probably "good boy"
About half a mile into the run, a black bird started circling overhead, making the very distinct "Get out of here!" chirping. 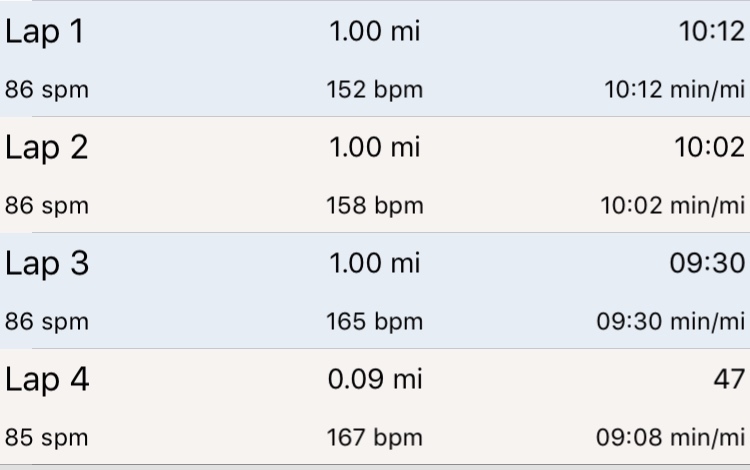 I decided to completely ignore my heart rate training today, and just run comfortably fast (well, as comfortably fast as possible while running with a dog). Instead of doing the lollipop route I'd planned (I didn't want to encounter the bird on the way back), I decided to take him to the lake's edge at mile 1.5 so he could cool off, and then we'd go home through the marsh. Joey looks so tiny here! It was fun to run through the marsh, but I was relieved to get back on the road. I leashed Joey, and we ran the rest of the way home, for a total of 3.1 miles. Then I sprayed him off with the hose and checked him for ticks. It ended up being one of my most enjoyable runs in a while! Joey couldn't have been happier to come with me, and it felt kind of adventurous. 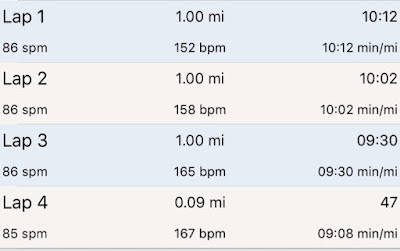 It also felt nice to run at a faster pace for the second half of the run--not "fast", really, but the pace that I used to call my "easy" pace before I started heart rate training. 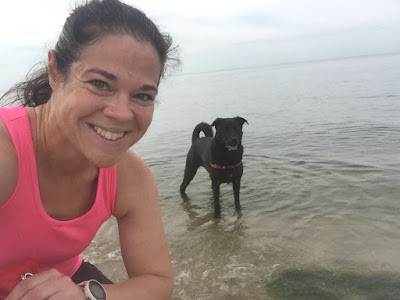 Technically, I could have crossed off a few of the runs on my Cookies Summer Running checklist--Rover Run, Trail Run, Beach Run, and Selfie Run--but I decided that I'm only going to mark off ONE from the list for each run that I do. That way, it'll keep me busy all summer. Today, I marked the Rover Run. Doesn't she look kind of like Estelle? She's a very sweet kitty! An interesting thing to try out might be cani-cross. You pick up a waist belt for yourself, and a gangline and harness for the dog (the gangline has bungee in it so it stretches some), and teach the dog to run in front of you, pulling on the harness and basically giving you an extra boost. You can run so much faster with less effort. And it is fun for you and the dog both. There are even cani-cross races you can enter, or you can hook the dog up to the bike for bikejoring, or to a scooter for dog scootering. It might be a fun fitness or running goal that isn't a distance, speed, or race for yourself. HAHA! When I started reading the post I automatically thought "I wonder if they'll give her a 'Friends' name." Great job at thinking outside the box for the run, instead of not doing it at all, and boy, did Joey look happy about it! What a fun run-- it looks like Joey loved it! What a fun run!!!! But...OMG MONICA!! She is perfect! Love the pics with Joey! Especially the pup smooch in the last one! He looks like a great dog! I wish my girl would run with me! The last time I took her for a WALK with me, she decided as we were crossing the street that she wanted to sit down and take a break! She's a 115 lb German Shepherd so you can imagine how hard it is to get her to move when she doesn't want to! Lol! Needless to say, a woman who was in her car at the stop sign waiting for us to cross had a good laugh that morning! I've been reading your blog for a while and the part of the country that you live in sounds so crazy to me. Between the diving and attacking birds, the bugs and bug seasons, the cold and snow... I feel like you are living through the plagues. I can't even believe it!